China’s shipbuilding scene has contracted dramatically in 2015. More pain is inevitable next year. Sam Chambers writes the cover story for the latest issue of SinoShip magazine being distributed widely at Marintec China this week. In the two years since the last edition of Marintec China, Asia’s largest shipping show, the local shipbuilding industry has changed dramatically. Some of the biggest names have been cut to shreds, mergers have been instigated and white lists deployed. In two years China’s shipbuilding scene has contracted dramatically, down from more than 1,500 yards to less than 100 actually taking orders. SinoShip anticipates that figure to fall still further to the point where a more mature shipbuilding nation emerges like in neighbouring South Korea and Japan where essentially there are around 10 big merged yards per country. 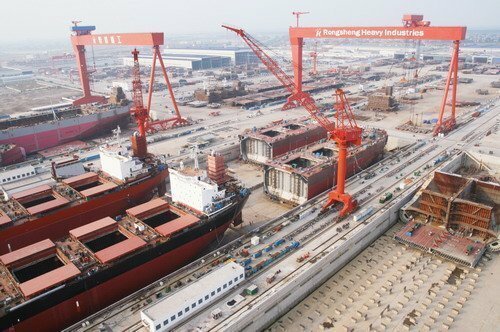 Ren Yuanlin, executive chairman of Yangzijiang Shipbuilding, said earlier this year he felt there was no need for more than 30 shipbuilders with yard facilities not exceeding 60m dwt. In the first nine months of 2015, Chinese shipyards received newbuilding orders totalling 18.16m dwt, a fall of 65.4% compared to the same period of 2014, according to figures from China Association of the National Shipbuilding Industry (Cansi). With Beijing pushing mergers in shipping, speculation continues to be rife that the two state-run big names in shipbuilding, China State Shipbuilding Corp (CSSC) and China Shipbuilding Industry Corp (CSIC), will be forced to merge. The pair were split apart in 1999. The biggest fall since the last Marintec has been at what was once China’s largest private yard, China Rongsheng Heavy Industries, now known as China Huarong Energy Company. This giant facility in Jiangsu now lies empty, a ghost yard and a symbol of the irrational excess of the build up of shipbuilding capacity in the People’s Republic in the previous decade. Beijing’s move to make white lists for approved yards for commercial shipbuilding and latterly offshore construction has turned the finance taps off for many who failed to make it to these lists, hastening consolidation. With newbuild prices low – and the gap between South Korean, Japanese ships compared to Chinese ones now much narrowed – the scant orders that are coming in are tendering to favour Japan and South Korea at the moment. China’s yards will rely on domestic orders for 2016 – another year of severe contraction is inevitable during this painful phase.